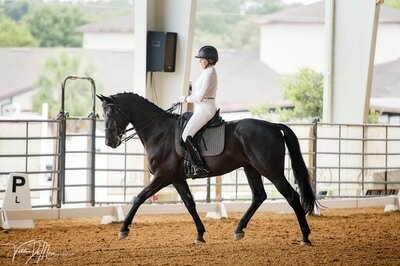 Mister Black is a 17h jet black Hanoverian/Trakehner imported from Lithuania. He is by Markuzzi, who is by Matcho, out of a Ukrainian Trakehner mare. We call him Cary Grant here at the barn. He is a beautiful horse with an exceptionally sweet and friendly personality. In 2016 Patricia and Mister Black received qualifying scores for Region 3 Championships at Third Level. They are working towards the FEI level and he shows talent for passage, piaffe, and pirouettes. Mister Black is always a joy to ride.